Making strawberry jam was not on my agenda this morning. But Wheels called from the General Store to say he found a dozen containers of strawberries that had just been moved to the sale shelf because they were going to “expire” tomorrow. Should he bring them home with the plumbing supplies he was purchasing? Well, of course! I went to the cupboard to get my one and only package of pectin and the big pot. He came home with boxes of beautiful red berries, only a few of which were unusable for just over $10. It didn’t take long to wash and stem the strawberries, cutting them into rough quarters. A heavy water glass mashed them down so there were no big chunks, just small bits. These waited in a bowl, while the sugar and pectin were mixed together in the bottom of the Dutch oven, the biggest pot I have. Be sure to measure accurately since the proportion of sugar to the other ingredients is what will make the jam set or become firm. I added the water and mashed strawberries to the sugar/pectin mixture in the pot, then began to stir continuously over medium heat until the mixture started to boil. Tip of the day – when buying long handled wooden spoons try them out in the store. Wave them around, pretend to stir really thick stuff. Are there edges that will leave blisters when stirring for 5-10 minutes at a time? Is the handle long enough to keep your hand above the heat? It’s worth the strange looks! There are different kinds of pectin so be sure to look at the box before buying. I chose a pectin intended for “less or no sugar needed recipes” by Sure Jell. It requires 25% less sugar than the regular pectin. Ball makes “no sugar needed fruit pectin” that calls for using juice as a sweetener. Both brands have directions for using Splenda as a substitute for the sugar. Not sure whether to use sugar or Splenda? Sure Jell shows 1 tablespoon of strawberry jam made with reduced sugar as having 30 calories and 7 grams of sugar/carbs. I chose this because I know our usual serving size will be more like one teaspoon. 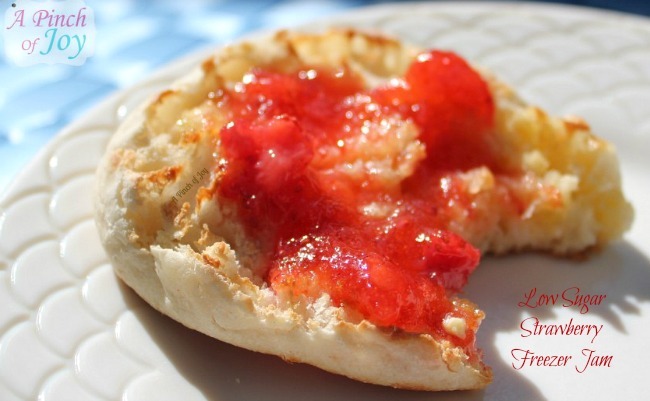 One tablespoon of jam made with Splenda has 5 calories and 1 gram of sugar/carb. You might choose this if you like a heap of jam on your toast! We ended up with three pints of mighty tasty jam – a pinch of joy for these crisp fall mornings that are moving quickly into winter. And there are enough berries in the freezer to make more mighty tasty jam around Valentine’s Day! Strawberry Jam is quick and easy to make and pop in the freezer for a delicious spread whenever you want a little something special. Have glass or plastic containers ready to be filled. Need six one cup or 3 one pint containers. Prepare fruit, using potato masher or something similar to crush berries. Do not puree. Measure exact amount of prepared fruit into bowl. Measure exact amount of sugar into large pan. Stir 1 box Sure-Jell for Less or No Sugar Needed Recipes Fruit Pectin into sugar. Add water, stir constantly over medium heat until mixture reaches boil. Stir fruit into pectin sugar mixture and stir until thoroughly mixed, at least one minute. Let stand at room temperature for 24 hours until set. Refrigerate up to three weeks or store in freezer for up to 1 year. Thaw frozen jam in refrigerator before using. I love strawberry everything, including jam! Thanks for sharing with the hearth and soul blog hop! Thank you so much for sharing with Full Plate Thursday. Hope you are having a great week end and please come back soon!